Who is the Manchester City F.C.? What is the Man City Fan Site? What is the Manchester City F.C. – Sierra Leone Branch? There is no doubt that football fans are one of the most devoted and enthusiastic sports supporters that there are. This holds true for the Man City fans who support Manchester City Football Club. To determine just how devoted they are, it only takes a quick visit to their site. It is technically a forum but it is an impressive one, and is not just one of your regular run of the mill type of forum either that you may be used to on the internet. Originally, a forum board was started in 1999 which eventually was shut down but fans were not going to go without an online meeting place, and therefore this new forum was created. Some of the things that this forum boasts of are how busy it is and how they are able to attract interaction from fans around the world. Not only is this a place for enthusiastic fans to share their thoughts and opinions, it’s also a place where they can share or find a great deal of information. For example, they can get match day threads and reports. Every forum needs to have a way to support itself and this one takes pride in their innovative approaches. While they could have appealed for donations, they have decided to open up a shop section where they have teamed up with a retro football shirt seller, which is really a nifty idea. For those who are collectors or are looking for some great football merchandise, this is a great opportunity. When it comes to news, football patriots will not want to miss what is going on the Man City Fan site. They have shared some great posts. 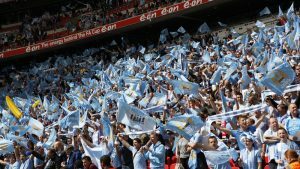 For those fans who want to feel like they are part of the Manchester City F.C., becoming a part of this fan club will allow them to enjoy that feeling.